It’s here! The long awaited (mostly by me) debut of Team Stryker Mission 004! This issue has been in the works since October so I’m very excited to get it in the hands of all the supportive Team Stryker fans out there. With Mission 004 I’m going to change things up a bit and start updating 3 times a week on Monday, Wednesday, Friday. On Monday you’ll get the newest page, on Wednesday the inks and on Friday the pencils of that page. There are so many steps that go into making each issue of Team Stryker I want to give each phase its due. 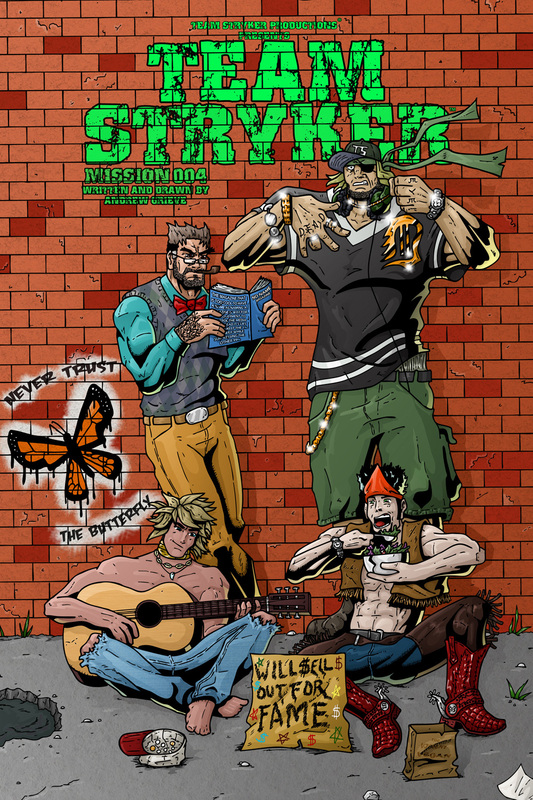 For the actual cover I wanted Team Stryker to take on Hipster culture with each member becoming a different kind of poser. You have your wannabe gangsta (Deadeye), your sophisticated hipster (Eagleheart), your surfer douche bag (Casanova) and your stuck in the past cowboy (V-Scope). It’s always a ton of fun for me to get to design different variations of Team Stryker and this cover was no exception. I drew a couple different concepts for the cover but the idea of TS just standing around being useless (like a lot of posers) was just too tempting. Hopefully you enjoy the cover and check back on Wednesday to see the inks for this unique page!